Melody was born and raised in Pittsburgh, Pennsylvania, where she lives with her husband, and son. She’s a dog lover and recently losing her two 15yr old girls (dogs) don’t be surprised to see a new doggie enter their lives soon (maybe two). After years of begging for a cat, she finally let her son adopt a kitten (even though she’s allergic! If that’s not motherly love, I don’t know what is!) A house just isn’t a home without pets. 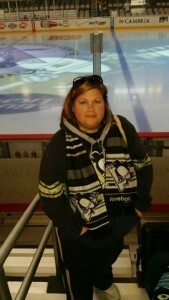 The whole family are avid Pittsburgh Penguins fans and like going to hockey games when they get the chance. Having met some of the players has fueled her interest in writing about them and creating wonderful stories. Melody has loved writing since she was small, in school she never met a creative writing assignment that she didn’t love. She is lucky enough to have a wonderful husband who encourages her to write. When she was laid off from her job of 14 years, he was supportive about letting her stay home and take care of their son. During that time she discovered hockey-romances and found a renewed love of reading as well as a passion for writing. She spends her spare time reading hockey romances. At holiday time she really enjoys any romance about Christmas. When it is the hockey off-season, she enjoys swimming and spending her days out in the sun. Basically if she’s not writing or reading, then she’s doing something that has to do with hockey! Watching hockey games inspires me. My mind works overtime thinking about what might go on behind the scenes, or in the guys personal lives. I am a seat of my pants writer! I have no real “process”. Once a storyline strikes me, I write it down. Sometimes it is so strong that I have to sit down and start the chapter just like that, other times it comes to me in bits and pieces. For example I might know how I want the story to end, but I have to figure out how to get there. I can’t listen to music while I’m writing and sometimes even turn the tv off. Too much other noise throws my focus off. I listen to my characters. No matter what I’m doing a conversation between characters might pop into my head, and it’s as real as if you were watching a scene on a tv show. If I’m lucky enough I will be where I can write it down. Don’t get discouraged and write what you love. Too many folks think they need to please the masses. Don’t get me wrong, a 5 star review is awesome. But you will get 1 star reviews too. Your book will not please everyone. If it is the story you want to tell, then by all means TELL IT! I chose to self publish because I wanted my stories told. I was going to go through traditional publishing, and if was given an offer I would certainly consider it. I did what worked for me. I also know authors who do both. If you are willing to put in the time to promote your book, self publishing is an awesome choice.